Another day, another new soda. Although vanilla might not be the most exciting new flavour, I was pleased to finally see it in a sugar free variety in the UK. 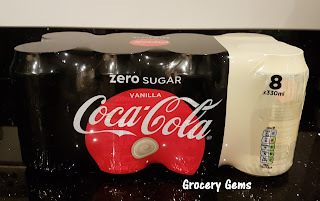 The original Coca-Cola Vanilla has been around for awhile and, even though I enjoy the flavour, I really don't like to drink the full-sugar version. 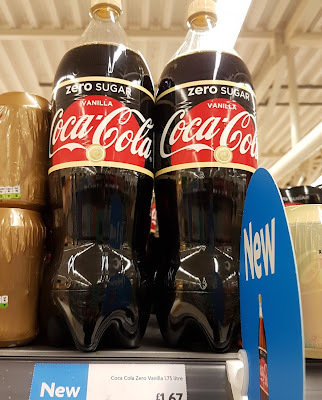 I bought a multipack of cans rather than a full bottle - it was annoying that the Coke Zero Vanilla bottles were the only ones not included in a 2 for £2.50 offer. This often seems to happen with new flavours. Overall, the Coke Zero Vanilla is a tasty enough drink but I did find that the vanilla flavour was not as strong as I was hoping it would be. It's definitely there, adding an extra sweetness, but it's not the creamy vanilla flavour I was expecting. 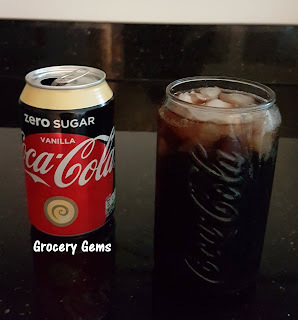 The whole thing tastes a little bit weak for my tastes (of course that might be because I'm used to adding a little vanilla Monin syrup to a Coke Zero for my vanilla fix!). I'm sure I will still buy the Coke Zero Vanilla again in the future but unfortunately the flavour is not as satisfying as the original Coca Cola Vanilla. If you've tried the new Coca Cola Zero Vanilla then let me know what you thought of it in the comments below - thanks! I bought the 1.5 litre bottle of this from the Morrisons near my university library since only drinks in lidded bottles or cups are allowed in the library area and I agree that the vanilla flavour is not as strong as I thought it would be. I used to love Diet Coke vanilla years ago, really hope that comes back! The vanilla flavour is weak, I ordered 10 bottles from Sainsburys and I'm on my last bottle and I feel as if I no longer even notice the vanilla and that it now tastes just like Coze Zero to me. I wanted to see if I was right in thinking that the flavour isn't strong by googling for reviews and your reviews and the first comment has confirmed this to me. And also to the second comment, I too enjoyed Diet Coke Vanilla and also wish it were out. For me, Pepsi Max is sweet enough and hope the vanilla variation is released in the UK as I've seen that it's available in Australia. I really like mango and peach flavours.